Burn this image to your microSD card then put it in your Raspberry Pi and fire it ip and proceed. Follow THIS tutorial only, there are subtle changes to PetRockBlog's and DigitalLumberjack's pages to get the B+ running smoothly. The link is for credit and reference only. First run the raspi-config script to extend your root file system. 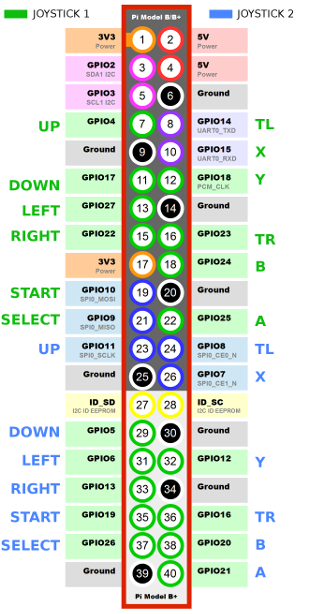 This part you can either configure your GPIO for 1 or 2 GPIO controllers (or mame cabinet controls), the GPIO pinout is as follows for B+ Pi, if you are only hooking up one joystick use the green only. The driver is loaded with the modprobe command and take one parameter nammed "map" representing connected joysticks. When you will have to load the driver you must pass a list of parameters that represent the list of connected Joysticks. The first parameter will be the joystick mapped to /dev/input/js0, the second to js1 etc.. If you have connected a joystick on RPi GPIOs (joystick 1 on the pinout image) you must pass "map=1" as a parameter. If you are on B+ revision and you connected 2 joysticks you must pass map="1,2" as a parameter. The GPIO joystick 1 events will be reported to the file "/dev/input/js0" and the GPIO joystick 2 events will be reported to "/dev/input/js1"
To exit and save hit control X then select Y and when it shows the file name "/etc/modules" hit enter. To exit the test program use ctrl+c, do not cycle the power to get out of it. Joypads tend to have stale state after opened. press some buttons and move some axis around to make sure joypad state is completely neutral before proceeding. Once complete save by using control and x, then y for yes, then enter for filename (make sure you don't accidentally hit a key and mess it up) then do this and let it boot to emulationstation, load a rom and see if it works (it should), if there are any discrepancies please don't hesitate to let me know. I hope this helps some of you who are having trouble adding buttons via the GPIO, I do not know how to set up any other interface so please do not ask this is for digital inputs only (buttons and arcade joysticks). i want to add more buttons to player 1. how will i do that? and what if i want to use a analog joystick? Hi, thanks for the great tutorial. I think when installing the problem occurs. Hopefully someone will help me out... its driving me nuts. There are new version since this tutorial. I was able to do the new tutorial of 1.0.4. I then tested and all the inputs were registerd. Because I would like to add 4 players, I installed the integrated MCP23017, I realized, that, but can not be activated and usable outputs GPB6, GPB7, GPA6 and GPB7. I want to use all of the outputs of this integrated, how do I activate them? Where is the file to edit the parameters of MCP23017? Hey all, I am on the latest retro Pie, and using the latest 0.1.4. When I run the install script, I eventually get a 'Error! Bad return status for module build on kernel: 3.18.9-v7+ (armv71). And when I modprobe, it just gives the FATAL: module mk_arcade_joystick_rpi not found. How do i reconfigure the buttons and such? I'm going to need 14 buttons + analog sticks using a 12bit ADC. ABC/XYZ/Start/Select/Dpad4/Ltrigger/Rtrigger + two 12bit analog channels. I know it's a lot but if i want compatibility with more emulators, i need a lot of buttons. n64 for example. My RPi needs a fan, heat will leech into the battery, so people saying I don't need a fan, don't understand how Li-Po batteries are affected by high temps. Cool pi = cool battery. I would very much so like to see a Pi2/Pi3 Zero, power and size. Hi, firstly - thanks for the work you've put in on this and the tutorial. I am however struggling to get the second controller (GPIO controller 2). To be recognised in any emulator other than MAME. The jstest works perfectly for both js0 and js1 but I just cannot get proper function in games elsewhere. I have manually created a GPIOcontroller2.cfg to see if that helped but it didn't. Can this be done with recalbox? Also, is there a similar graphic for the pin out for the raspberry pi 2? ivwshane wrote: Also, is there a similar graphic for the pin out for the raspberry pi 2? I have the raspberry pi 2, model B, 2 joysticks and 8 buttons each player.. but I have to use the keyboard..
any clue what can I do??? Hi. Thanks for the great script by the way. Its EXACTLY what I was looking for. I just have some issues I hope someone can help me with. I had gotten this to work perfectly on my Raspberry Pi 3 running RetroPie v3.6, however, I recently tried to update to RetroPie v3.8.1 and when I run the script it seems to work fine, but whenever I try to start the script with sudo modprobe mk_arcade_joystick_rpi map=1,2 I get the following error. modprobe: FATAL: Module mk_arcade_joystick_rpi not found. I followed the tutorial exactly and even made sure to update with sudo sh ./install.sh updatesystem as well as performed a reboot before installing with sudo sh ./install.sh. I have tried to perform this install twice and both times I still get modprobe: FATAL: Module mk_arcade_joystick_rpi not found. Any help on solving this would be greatly appeciated. Thanks. Which explains the issue as well as resolves it, at least for me on my Raspberry Pi 3 running RetroPie v3.8.1. Basically what it says is that you need to do a manual install for the GPIO Joystick drivers. Heres a synopsis. Opens modules with nano editor for editing. Add the following line to the now open file “mk_arcade_joystick_rpi” without quotes. Save the file with CTRL+O press ENTER to save and then CTRL+X to exit. Add the following line to the file "options mk_arcade_joystick_rpi map=1,2". for my case, my modprobe.d conf file named in: "mk_arcade_joystick_rpi.conf"
after edit this, my 2p controller live again. thanks god. take an hour to figure it out . In my nearest plans is to build a console on RPi Zero. Do I need to do some changes in scripts? I think gpio map is quite the same on b+ and zero. I am going to build a console on RPi Zero (i have to usea very flat device in my case). Do i need to do any changes in scripts and drivers due to the diffirence of pinout gpio on tpi zero and rpi b(+). Thank you. I´m quite new to rpi shell, but following the commands I wasn´t able to setup the gpio.